I’m wrapping up my five days of Canadian food with a delicious treat Vancouver Island! 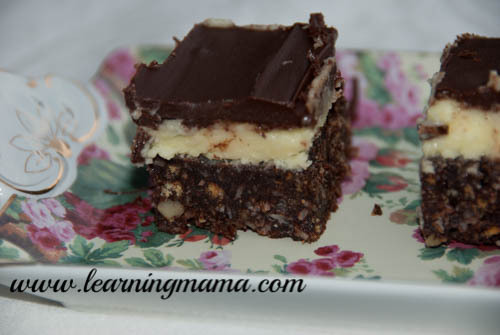 Nanaimo Bar’s are a sweet, creamy chocolatey treat named for the city of Nanaimo, British Columbia. The bottom layer of these beauties is a chocolate, almond, coconut, and graham combination.The centre is sweet and creamy; and the top is a firm, semi-sweet chocolate. I really can’t decide which part is my favourite! My girls are going to love these as a special treat for their afternoon tea parties and they freeze well so I can dole them out one at at time. They are very sweet and rich, I don’t trust myself with a a pan of them within easy reach! It’s a great, fancy treat for a church event, potluck or for christmastime! Melt first 3 ingredients in top of double boiler. Add egg and stir to cook and thicken. Remove from heat and stir in crumbs, coconut, and nuts. Press firmly into an ungreased 8″ x 8″ pan. Cream butter, cream, custard powder, and icing sugar together well. Spread over bottom layer. Melt chocolate and butter over low heat(the microwave works well here, stopping and stirring every 15-30 seconds) Cool. When cool but still runny, pour over second layer and chill in refrigerator. Now excuse me while I go and freeze half of these for the kids! This wraps up my Five Days of Canadian Food! Can you think of any quintessentially Canadian foods that I missed?